Cheese making kits enable you to create (primarily soft) cheeses at home (Source). They typically include all of the necessary ingredients, minus the milk and some of the hardware (pots, pans, thermometer). Great as starter kits, buyers tell us that once they get going creating cheese they begin to purchase the kit's ingredients separately, in bulk, to experiment more deeply (Source). The Gardener's Supply cheese kit can produce hard cheese- though you'll have to separately purchase cheese wax. Popular soft cheeses you can create with all of the kits include: Mozzarella, Goat Cheese, Queso Blanco, Chevre, Marscapone, Queso Fresco, and Ricotta (more recipes here). You'll be able to make multiple batches of cheese using these kits. 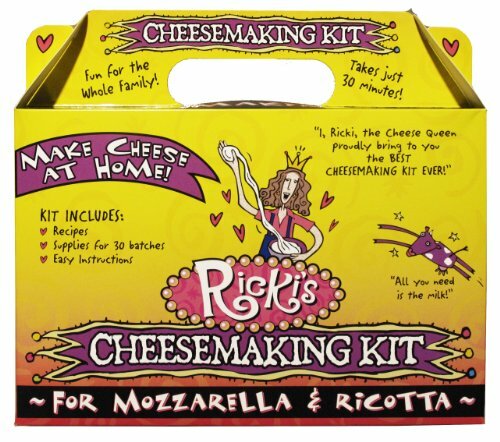 For example, the Ricki's cheese-making kit has enough ingredients for around 30 batches of cheese, with each batch generating approximately 1 lb. of cheese. So if you make one batch of cheese a week, it'll last you half a year. The U.S. made, Standing Stone cheese kit enables you to create Chevre, Mozzarella, Butter, Goat Cheese, Queso Fresco, Queso Blanco, Ricotta and Marscapone. If you want to make preservative-free, Non-GMO cheese, this is the way to do it. They advise you can use goat, cow, sheep or store-bought milk. When it comes to goat or chevre cheese- you'll have to buy buttermilk and use that as the culture. It doesn't include a thermometer, so make sure you have one. Though they also produce an advanced kit that ships with instructional DVDs, seasonal spices and a thermometer. 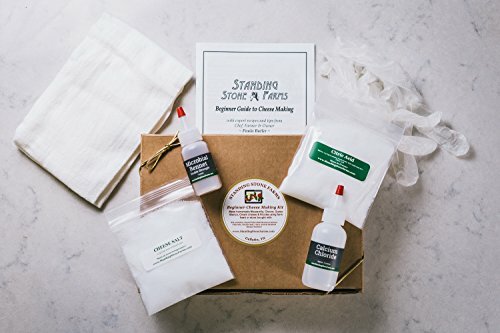 This cheese making kit offered by Standing Stone Farms is a good option for someone who needs a beginner’s kit for making various types of homemade cheese. Users love the results they got from using this kit, but some do complain about missing warning regarding necessary refrigeration. This product is a basic kit which contains all the ingredients (except the dairy products) you need to make delicious cheeses such as mozzarella, goat cheese, mascarpone and ricotta. It has enough ingredients to turn 20 gallons of milk into preservative-free, non-GMO cheese in as little as 20 minutes. The kit includes detailed recipes and easy to follow instructions.This cheese making kit seems like a good choice if you are looking for an interesting gift for somebody who likes cooking and doing things from scratch. The general user consensus concerning the Standing Stone Farms cheese making kit is that it is an excellent beginner cheese making kit and it has everything you need except for the thermometer. One happy purchaser states that the little cookbook gives good information and very easy to follow instructions. Another one shares that the instructions are very clear and that the product worked perfectly. However, some buyers complain about the lack of information on the package regarding the fact that some ingredients require refrigeration. 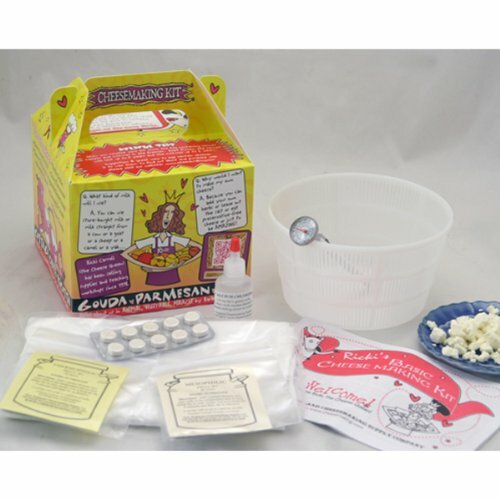 This cheese making kit offered by New England Cheese making Supply Company is a good option for someone who wants to make their own mozzarella or ricotta cheese. Users love the deliciousness of the homemade cheese and simplicity of making it, but do complain about unclear instructions. This product includes everything you need for making cheese: 8-ounce citric acid, 8-ounce cheese salt, 10 tablets of vegetable rennet, 1-yard butter muslin, 1 thermometer and 1 recipe booklet. You can make your own cheese with this kit in just 30 minutes. This kit features enough ingredients for making about 30 pounds of cheese. This cheese making set might be a solid choice if you are looking for a perfect prepackaged gift for someone who is interested in either cheese or cooking at home. In general, users have a favorable opinion of the New England Cheese making Supply Company cheese making kit, saying that it is a great way to start making cheese. All you need is included in the set and you can easily make wonderful cheese with it. One purchaser advised to make sure you can find non-“ultra-pasteurized” milk otherwise it’ll never make curds. However, some buyers complain about the instructions which are not clear nor detailed. One buyer comments that the kit is a little expensive considering that all of the ingredients can be bought separately in bigger quantities for less money. 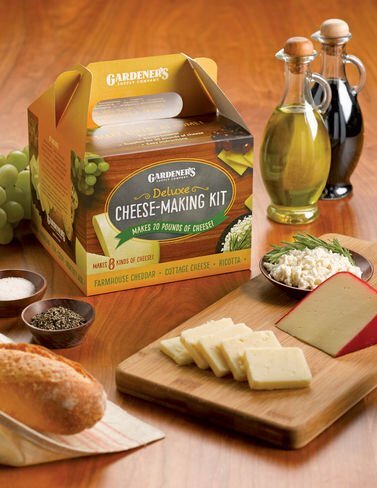 If you are looking for a top-rated cheese making kit, you might want to consider this deluxe set offered by Gardener’s Supply Company.Users love the simplicity and effectiveness of this cheese making set, but some do complain about the instructions that could be written in more detail. This product is a kit that provides you with all the ingredients you need to make eight kinds of fresh, preservative-free types of cheese right at home. You can make your own farmhouse cheddar, gouda, Colby, Monterey jack, cottage, feta, ricotta and parmesan cheese. If you are looking for a deluxe cheese making kit for soft cheeses, this might be a good option. In general, users have a favorable opinion of this cheese making kit and they state that it is very simple to use and that a cheese turns out tasty. One satisfied purchaser advises following the directions precisely. However, some purchasers complain about the instructions that don’t include all the steps, which can make the process too complex. This cheese making kit offered by Ricki’s is a solid option for those who need a basic kit for beginners. Users like the simplicity of making a tasty cheese, but do complain about the mold being wrong regarding its type and size. This product can be used to create a cheese the way you like it by adding herbs or leaving out the salt and preservatives. It includes all the ingredients necessary to make 8 fabulous varieties of cheese, including a recipe booklet, basic cheese kit mold, coarse cheesecloth and a dairy thermometer. This cheese making kit could be a bad choice though if you want to make perfect looking wheels of cheese. In general, buyers say that this is a good enough cheese making kit for a beginner since the basic supplies are provided. One satisfied user says that it is a perfect gift for any cheese lover. Another one shares that she managed to make some really fine cheese. However, several buyers complain about the instructions being a little vague and hard to follow for a beginner. Another thing they complain aboutis the basket cheese mold, which is not the proper mold for most of the cheeses in the cookbook. Plus, one dissatisfied purchaser shares, the mold is small and conical instead of a flat sided cylinder. 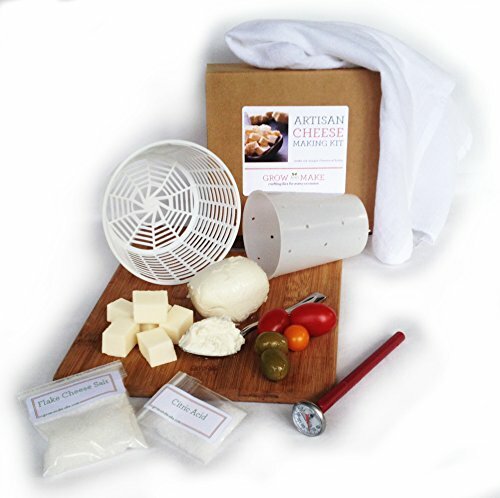 If you are looking for a cheese making kit, you might want to consider this artisan set offered by Grow and Make. Users like that the kit does the job well for a complete beginner, but do complain about the quality of the materials and ingredients. This product is a kit with which you can make mozzarella, ricotta, goat chevre, paneer and queso blanco. It includes a cheese shaping mold, cheesecloth, thermometer, cheese salt, citric acid, instructions and recipes. If you are looking fora good quality cheese making kit, this might not be such a good option. In general, users have a favorable opinion of this Grow and Make cheese making kit, saying that it is a nice basic kit that provides you with a few recipes and tips that will make it easy to make a few simple kinds of cheese at home. However, some buyers complain about the quality of the product. One purchaser shares that the material is cheap and not worth half of what you pay for. Another one says that the cheese molds are too small and poorly made. The first cheese making a kit we examined is provided by Standing Stone Farms- it's advertised as a mozzarella, ricotta, burricota, DIY kit. They market it as a nearly all-in-one solution, providing all of the necessary ingredients minus the perishable dairy products you need to create mouth-watering cheeses in your own home. Indeed, they supply a robust quantity of ingredients that will help you convert 20 gallons of milk and into non-genetically modified cheeses in under 20 minutes. The kit includes a vegetarian liquid microbial rennet, calcium chloride, citric acid, cheese salt, disposable gloves and a drain cloth. In terms of the equipment that you need, you'll have to make sure that you got a stainless steel pot, a thermometer some whole milk as well as either a cultured buttermilk or heavy cream. Reviewers say that depending on the milk you are using, the cheese you are creating, you can expect to get about 1 pound of cheese for every gallon of milk that you use. This kit will help you make soft cheeses, primarily mozzarella and ricotta- the included recipe book provides instructions for a variety of other soft cheeses you can make at home. Buyers say that this cheese making starter kit is a solid option for beginners- the taste was exceptional, while the appearance wasn't restaurant-quality. One buyer said it was pretty easy to do- all you need to do to get started is to mix the milk with the citric acid, heat it up, add the diluted calcium chloride and liquid rennet, use the thermometer to assess temperature and then the cheesecloth to strain it once it reaches a thick porridge-like consistency. Another novice cook says he was thrilled with the mozzarella he made, saying that the instructions were clear and that the pasteurized whole milk he used created a delicious mozzarella-endorsing it as a great gift idea for like-minded cheese enthusiasts in the family. The second cheese making kit we took a look at is provided by New England Cheesemaking Supply Company- it ships with 8 ounces of citric acid, cheese salt, 10 vegetable rennet tablets, a cheesecloth, a thermometer and a recipe book. One buyer initially wondered whether they could use this cheese kit in conjunction with soy or almond milk and the consensus was that because the rennet reacts to the milk's lactose that it wouldn't be an advisable way to make an edible cheese. Buyers say that this cheese making kit will let you create around 30 different batches of cheese, with each batch weighing in at around one a pound. Buyers say that they have used homogenized/pasteurized whole milk- with some buyers supplementing with the calcium chloride. An aspiring fromager told us that while you can purchase all the ingredients separately for less money, as a kit it's a great gift idea. Indeed, people self-described as curd nerds, going down the rabbit hole after purchasing saying this starter kit and becoming obsessed with creating their own cheeses from home. The last artisanal cheesemaking kit we examined is provided by Grow and Make- it's advertised as a means of creating queso blanco, goat chèvre, ricotta, and mozzarella. While buyers were unimpressed by the inadequately sized and poorly constructed cheese molds, instructions were easily understandable and the ingredients abundant enough to get you started making cheese. Another reviewer told us as a long time cheese lover that this kit enabled him to explore the subtle but distinct differences between different types of cheeses. Additionally, once the cheeses had been created, it was fun to do meal planning around these homemade soft cheeses. The way cheese is created from milk relies on the interaction of a dairy bacteria and rennet. It interacts with milk proteins and causes them to coalesce into curds, which is the initial stage of cheese creation. You can actually make cheese from nearly any style of milk, whether it is powder dry, 1%, 2%, skimmed or even sheep and goat milk (Source). 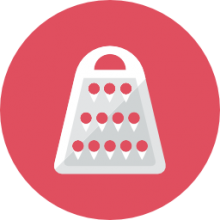 As you prepare to make your cheese, it's important that you sanitize surface areas, utensils, pots and pans as well as the cheesecloth. The temperature should also be controlled. You'll be able to tell when the card is ready to be cut by putting your finger into a 45° angle and observing the curd break neatly around your finger. you can also check the pH and acidity of your cheese- it's important to understand that making cheese relies in large measure on acid development. Different cheeses have different target acid development profiles that end up determining their particular style- so using an acid monitor can be an effective way to accurately assess city levels in your cheeses' profile.